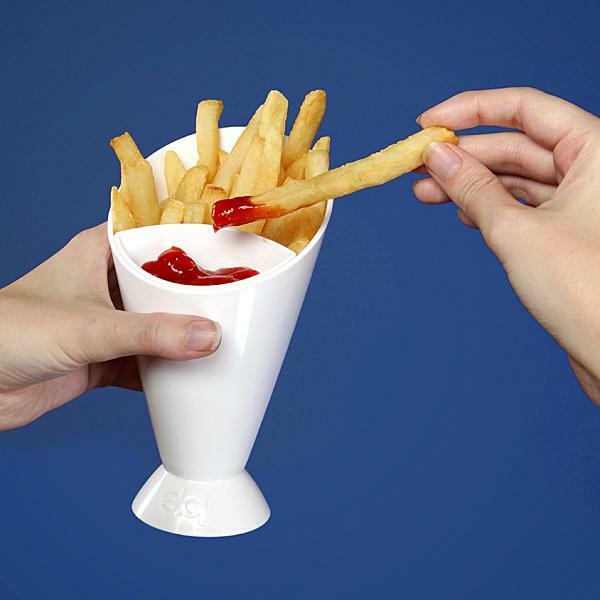 French fry dipping cup that has a little compartment for your sauce. 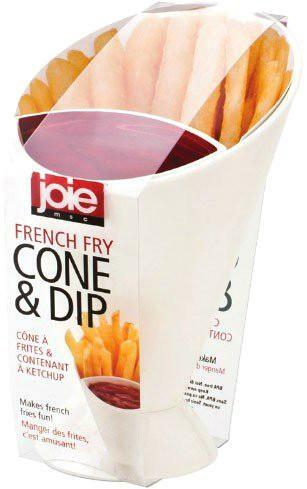 The french fries go in the back and the sauce in the pocket at the front, so you only have to hold one thing. Store your french fries and dipping sauce in one hand with this neat container, great for watching television and movies with. Removable dipping cup that slots into the front of the larger chip container. Classy, almost space age design. The design of the device is definitely nice. Its a very nice shape to hold as it basically feels like a cup. The dipping container coming in and out is a good feature as well. To add further the shape looks pretty sharp with a diagonal sliced top that works well visually. It is the sort of design I somehow feel Steve Jobs would have liked. Very clean and simple, but elegant. The curve at the bottom keeps it very well balanced and the base is quite sturdy. The design is essentially a typical cup really, specifically a milkshake cup. Apparently this item is not dishwasher safe, which is very disappointing really. Its the only clear negative about it and while it has a perfect rating on Amazon at the time of writing I have rated it a bit lower because of this fault. I really do not know how something can not be safe for the dishwasher in this day. I suppose the item itself is of questionable use really as it is probably more fuss than just having a normal cardboard container and sauce satchel or even just put them all on a plate. A nice and well made item that may not find much use and should simply have been dishwasher safe.